You know what makes me happy lately? Several things. The first: when I walk the bridge in the morning to work, Michael often passes by me on his bike as he’s also heading into work. When he passes by me, he whistles. 🙂 That always puts a smile on my face. How cute is that? No matter how hard my day was, Fat Kitty puts a smile on my face and makes my heart swell. The third thing that makes me happy right now: soup! I am ridiculously excited about a new cookbook I bought, “Taste of Home: The Ultimate Soup Cookbook.” I saw it at a friend’s house last month and flipped through it, drooling over most of the recipes. I started to copy some to try and realized that it made more sense to just buy the book. Lucky for me, it was super cheap on Amazon. The Broccoli Cheddar Soup I made recently came from this book. I forewarned Michael that he better get used to eating soup this winter because my goal is to work through this book. Most of the recipes are simple, with only a handful of ingredients and easy instructions. The second recipe I decided to try was Black Bean Corn Chowder. In a blender, combine the cream, and 3/4 cup black beans. Cover and process until smooth. Set aside. In a small saucepan, saute onion in oil until tender. Add garlic and cook 1 minute more. 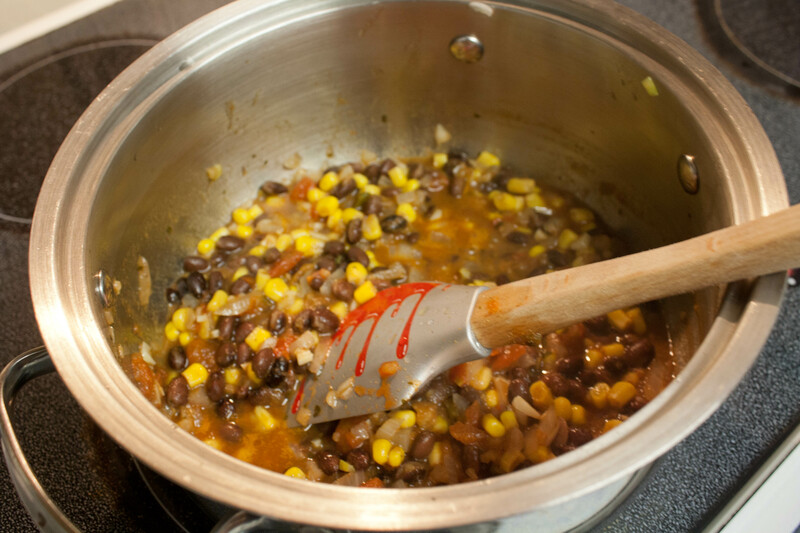 Stir in the salsa, corn, lime juice, cumin and remaining beans. Reduce the heat. Stir in the cream mixture. Cook uncovered, for 2-3 minutes or until heated through. I made a few slight changes. I didn’t have half and half and didn’t want to use it, honestly. I looked online for some alternatives and I could either use evaporated milk or a mixture of milk and 2 tablespoons of butter. I used 1% milk and the butter, mixed it together and saved about 50 calories on the recipe. I also used canned corn instead of fresh or frozen. This recipe was really quick. It took no time at all. I doubled the recipe because I wanted to have some leftovers for lunch for the week. I’m glad I did because the recipe was so delicious. Do you like the spatula? It’s kind of hard to see but it’s a Halloween spatula with dripping “blood” on it. My mom sent it to us for Halloween. 🙂 Michael loves it and has been using it non-stop. The soup was creamy and flavorful and the cumin REALLY stood out. I like the sweetness of the corn in the soup. It balanced out the other flavors. I did not notice a difference in the flavors or consistency by skipping the half and half, either. 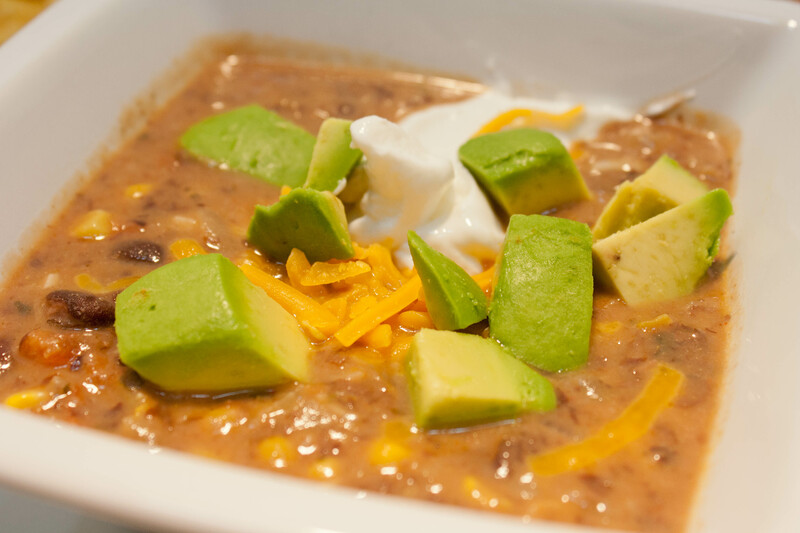 I topped the chowder with a tiny bit of shredded sharp cheddar, a spoonful of sour cream and then 1/4 of an avocado cubed up. We had some tortilla chips on the side. The soup was thick and could either be eaten with a spoon or the chips. I would most definitely make this soup again! I’d probably add some jalapenos to it next time to make it a bit spicier. QUESTION: What is your favorite cookbook? Awww…I just LOVE the kitty story. Happy Friday Lisa!!!! Awww it is so cute when your cat has missed you! Mine just gather around the food bowl and meow at me! Haha! Mine usually do that too, but Fat Kitty ALWAYS sits in the window. Before I moved out and left my cats with my mom, my older female used t greet me at the door. 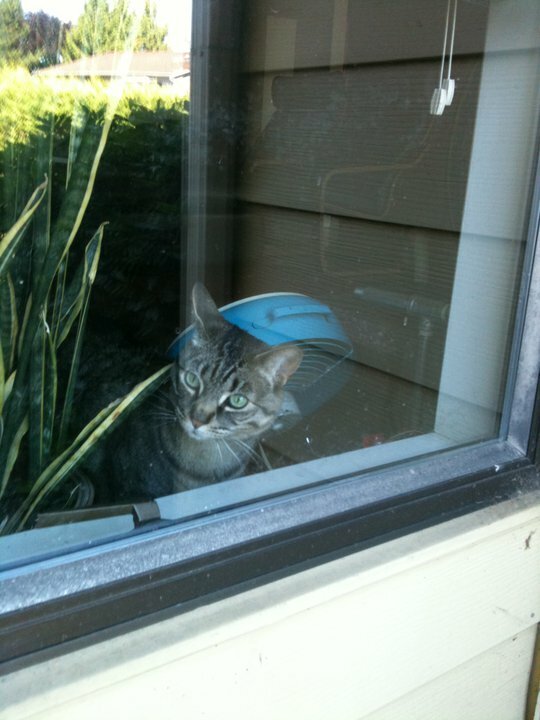 She’d sit in the front window and watch for me to come home. Also, we’re gonna have to try that chowder I think! Looks delicious! It was pretty good! Enjoy! That looks like a book I NEED right now! Thanks for the tip! Get the book! So far it’s really good. And seriously, it was only like 65 cents on Amazon…. Hi Lisa, is Fat Kitty just a name or is he really fat? Anyway, that’s a cute detail about your furry friend. 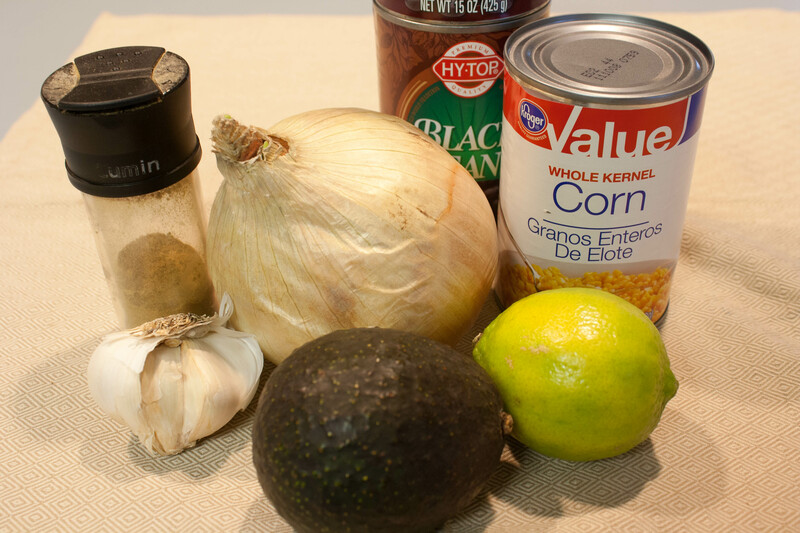 The Black Bean Corn Chowder dish looks very healthy but I try to stay away from canned stuff and processed foods as much as possible. Ryan Thorr recently posted..Exercise: What The Bleep Do You Know? “Fat Kitty” is the nickname I use for him on the blog. I don’t call him that in real life. 🙂 But he kind of chunky. He could easily lose about 4 pounds! 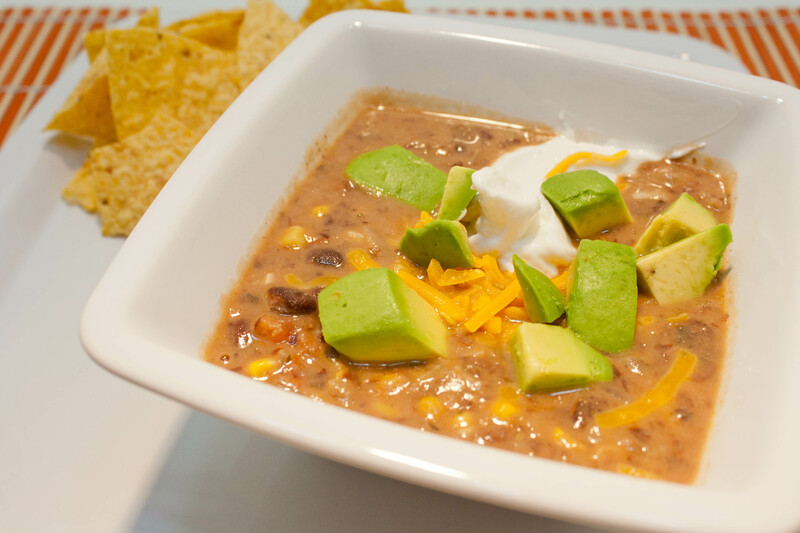 The black bean chowder would work great with dried beans, too. It would just take longer. I had the leftovers for two lunches. They were much better with a little sour cream on top. Our dog misses us but our cat tolerates us. 🙂 It’s true but we love him anyway.